I need the parts that go over the liner, the flat part at the top, the panel that goes over the top, they are aluminum. The pool is about fifteen years old and its a 24' round. These go all the way around on the top, they jump off of them? please help. Hi. The parts you are looking for are called top rails. We had a store here in Arizona selling those many years ago, but I sure can't remember what they were called. I anyone knows the maker of the this above ground pool let us know, or if you know where top rails like this can be found let us know. Many times finding parts for a pool this old will prove to be impossible, and if you do find them they will be expensive. I would start searching the ads for used pools. Many times used pools are free if you dismantle and move. Or other times they are crazy cheap. You bring them home and then just use the parts you need. You may wind up with tons of good cleaning equipment, a new filter and other cool stuff. We had quite a few rusted over the 18 years of our pool. This spring was the worst. 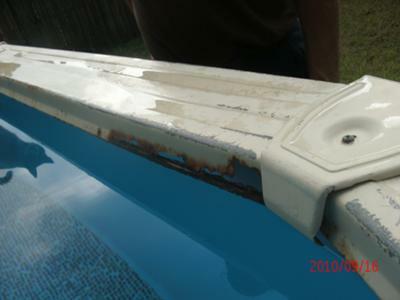 We talked to several pool providers and found it almost impossible to get the parts. I went to Menards and bought "Rust-Oleum" Latex Aluminum Primer. We peeled back the rest of the paint, sanded with both rough and fine sand paper. I have painted the rails twice now and they are as good as new. Will let you know what happens next spring. Depending on your brand try intheswim.com or call them at 18002887946 they will also send many free magazines with all kinds of stuff. What kind of pool is that? I need the top plates for the same pool. My pool is 18 year old and they had all the parts for it. Good luck to all. It sure looks like a Tidewater pool. Made by Delair. Delair is no longer handling parts. If I do not find a way to fix my pool, I will be selling all of the parts.... I will check back and let you know. Anyway, I would like to know, does this pool have a stabilizing bar under those top seats but over the receiver that holds the liner? 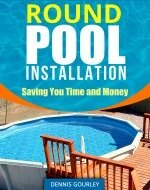 I am looking for the install video or instructions for this pool. 231-378-2833 My name is Danielle.... if anyone has the installation instructions or video that they would be willing to let me rent and return to you, I would really appreciate it! Hi, Did anyone have any luck finding the top rails to the pool that was in the image? My problem is that I don't know the maker of my pool. I have rusty top rails. The pool is 21' around and holds 10,000 gallons. The aluminum rails in the image are an exact match to my own. We have a few rust spots on our dough boy pool. After you sanded your spots, and used rustolium, what color paint did you use? Have an older pool with aluminum rails that need replaced, can I go with the newer plastic rails? Did you ever find these? I have these exact ones!